New Delhi: India’s wholesale prices rose for a fourth week, making it harder for central bank governor D. Subbarao to keep interest rates low and boost economic growth without fanning inflation. “The Reserve Bank of India’s communications are likely to be increasingly hawkish in a bid to manage inflationary expectations," said Sujan Hajra, chief economist at Anand Rathi Financial Services Ltd in Mumbai. “India’s monetary authorities face a quandary." India’s wholesale prices rose in September after declining for three months, and consumer price inflation is already running above 10%. Finance minister Pranab Mukherjee said on Wednesday inflation may accelerate to as high as 6% by the end of March, more than the central bank’s 5% estimate. 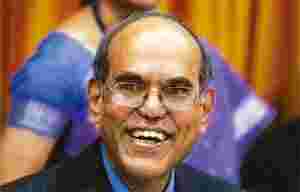 Subbarao said this week India may have to raise interest rates ahead of advanced economies in view of incipient inflationary pressures. India needs a careful management of trade-offs between supporting growth with lower borrowing costs and curbing inflation, the governor said in Istanbul on 5 October. Consumer prices paid by farm workers jumped 12.89% in August from a year earlier. Inflation for rural workers was 12.67% and consumer prices paid by industrial workers climbed 11.72%. With inflation coming higher than expected, rate hikes are coming closer, Pranjul Bhandari and Tushar Poddar, Mumbai- based economists with Goldman Sachs Group Inc., wrote in a report. They expect India’s first rate increases in January and predict the central bank may raise the reverse-repurchase rate by 300 basis points in 2010 to 6.25%.